You might think this is an insignificant topic but the truth is, it’s more important than you may think. We believe all dogs should be micro-chipped and that all dogs should wear an identification tag on their collar in case they get lost. Losing your dog can happen to anyone so ditch the “I’m better than that.” arrogance and don’t think for even one split second that it could never happen to you! As paranoid as I am about keeping tabs on my FurKids I’m first and foremost a human and as such make mistakes. If your dog’s ID tag falls off and if he’s chipped and if someone checks for and locates the chip, the chances of your dog getting home isn’t guaranteed but at least it increases tremendously. 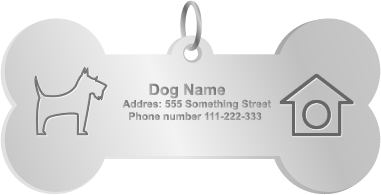 But … is your dog’s name (all) that should be engraved on the tag? The simple answer is NO. And let’s say someone finds him and the finder is one of those really nice people that wants to help get your dog home rather than some demented individual (there are many!) that would take advantage of having found a free dog and do harm to your FurKid. The latter happens all too often and if your dog winds up in some sicko’s hands, none of what I say will make any difference because you’ll likely never see your dog again unless of course he makes the front page of the paper having been found beaten or dead. Are you beginning to see why hanging an ID tag on your dog is not insignificant or that what you put on that tag means more than you thought? So’s not to wander off into the land of things we don’t want to think about, let’s hope for the best and say a nice person found your dog. Because dogs can’t talk, you need to give the finder as many avenues as possible to find you. So what are some good things to put on your dog’s tag that will give getting your dog home quickly and safely the best chance? A tag with his name on it is a great start, or is it? The finder will know what to call him which will make him feel less lost, but a simple name-only tag isn’t enough to get your dog home. It also may not be the smartest thing you can put on a dog tag. Let’s think on the dark side for a moment. If your dog’s name is on his tag, you’ve just given the wrong people a way to get on the right side of your dog. It allows them to call your dog by name in a voice which makes your dog think they’re ok when they’re really not. I like the way Well Minded Pets puts it in their article What NOT to Put on Your Dog’s ID Tag by reminding you about the Michael Vick types who lurk anywhere and everywhere. I wish I’d seen their article sooner, it really gave me something to think about. Consider putting your name on the tag instead. 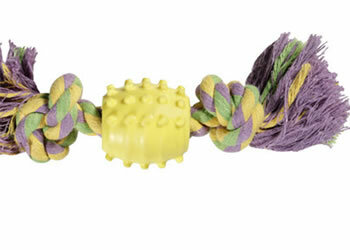 This allows the finder to know they’ve reached the dog’s true owner when they call you. I know I’d want to verify I was returning a dog to it’s real owner if I found one and putting your name on the tag would help me do this. What if you’ve moved and haven’t updated your dog’s tag? Your old address isn’t going to help your dog get home. What if the person who found your dog just drives over to the address on the tag where you don’t live anymore or maybe you’re just not home and won’t be for several hours or even several days. I couldn’t but some people actually do go out of town when their dog is missing. I suppose they might tie the dog up in the yard for you but you can’t count on that. If you’ve moved, your dog is still in the hands of the strangers who now live in the house you used to. If they do tie the dog in what’s still your yard and you’re gone for a lengthy out-of-town visit with Gramma Helen, there sits your dog anxiously awaiting your return minus food and water for how many days? You also risk a visit from the cops along with the associated and unpleasant consequences they might hang you with for dog neglect. You might also ask yourself if you really want dog-nappers, snatchers, abusers and dog-fighting types to have your address? I prefer a phone number myself. That way if someone is trying to find me to return my dog to me and I’m not home, they can still reach me by phone. The kicker with phone numbers and addresses is that if you change either and don’t update your dog’s tag, the tag is useless. It was just a few weeks ago when we were putting our own dog’s new annual city license on their collars that I took a good look at the existing tags and gasped in shock when I realized that the phone number on them was ancient history! I couldn’t believe I’d not realized this sooner and immediately ordered shiny new red heart tags with current information engraved on them. If you put a phone number on the tag, make sure it’s the number that you’re likely to answer the quickest. In most cases it’s your cell phone. Does Your Dog Have Medical Issues or Require Medications? This is another good one! If someone finds your dog with a tag that says he needs meds, chances are they’re going to make an extra effort to get your dog home. You don’t need to put the medication or what it’s for on the tag. If your dog’s got a serious health condition, noting that on the tag might just prompt the finder to take the dog to a vet for safekeeping. Knowing a dog needs meds or may have something serious health-wise going on might just be enough of a push to go that extra mile to find the dog’s owner. It may also be enough to make the bad guy that picked your dog up drop him off at the next corner and a dog wandering the streets as a stray where he’s got a chance of someone who cares finding him is better off than being in the hands of someone out to harm him. I think a lot of people wouldn’t bother with this. They may feel it’s redundant but I like this idea. Reading “I’m Microchipped” prompts people to take the dog where there’s a chip reader (humane societies, vets and many police departments do) which may be something some people wouldn’t think to do without the prompt. If the chip has moved from the common injection point(s) the tag tells them “It’s there, please find it!” so the person on the other end of the chip reader will scan other areas of your dog’s body. It also might scare off the dude who wants to use your dog for things dogs should not be used for. I don’t recommend adding “I’m microchipped” to the tag if your dog isn’t chipped thinking you can get around paying for the actual chipping of your dog this way. Adding this information also eliminates your dog wearing the cheap pretty much useless plastic tag some of the micro-chipping companies include in their packages. I didn’t bother using that myself. This is something I’ve not heard of putting on a tag, but it comes to mind that if you’ve got a dog that isn’t always fond of other dogs this might be something to think about. Let’s say the person finding your dog is so kind as to take it home where their own dog lives. If your dog isn’t always other-dog friendly, they may find themselves unexpectedly faced with a dog fight on their hands. Believe it or not there are still people that live the Pollyanna life and have never heard of dog-to-dog aggression and so one dog not getting along with another doesn’t cross their minds. Others believe that because their dog gets along with other dogs they don’t give a second thought to bringing a strange dog into the house. We run into this “Oh he won’t hurt anybody.” mindset on walks occasionally (as their dog is charging at us!) and it just blows my mind. Not only could their dog get hurt, but so could your dog or a child or anyone else. They might even have a trigger-happy family member that would shoot your dog to stop the fight. Adding something like “I don’t like other dogs.” to your dog’s tag could prevent some serious and even deadly results. There are no hard and fast rules or laws on what to put on an ID tag. Whatever you decide you don’t need to say things like “If found please call …” which just takes up room on the tag where more important information could be included. Keep it simple but the biggest thing is the best contact-you information possible. Whatever is the best way to contact you needs to be on that tag and make sure to check your dog’s ID tag every year when you put their new license tag on or you could wind up like me — a few years behind on being current. I shudder to think what may have happened had one of our dogs gotten lost with that old info on the tag. Even though other tags were current, old information on even one tag could delay your dog getting home. The more I think about it the more I agree with Well Minded Mutts. I’ll have to drop them a thank you note for the eye opener and I think I’m going to order new tags minus our dogs’ names to replace the new tags I just got. How about you? Agree? Disagree? What’s on your dog’s tag? I realize this is an older post but in case anyone else comes upon this – a very good thing to add would be the name or phone number of your vet! They will have the records on file for both your baby and you, as well as any microchip numbers, and usually can help make arrangements to return your loved one to you. I understand the logic in not putting your dogs name on their tag, but as Susan said, whomever found your dog wouldn’t be able to read the name if they didn’t already have them,… And honestly if they were bad people, I’m not going to get my dog back regardless. If they were good people then I would take comfort in knowing they could call my dog by its correct name so that it might ease tension/ anxiety for the dog before returning home. Just a thought. I think the statement above on why not to put your dogs name on an id tag simply doesn’t make sense. If someone can read your dogs name on the tag, they already have your dog. Your dog is not going to trust someone based on whether or not they know its name. They have already approached whomever based on their level of comfort w people in general or the person trying to help them. 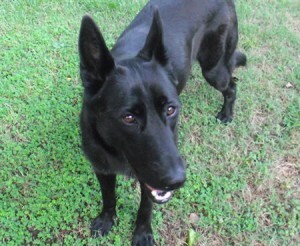 Hopefully it is in fact help and not hurt but name or no name is not going to make or break the deal to the dog. Probably not a deal breaker, but I still think if someone uses your dog’s name it lends an air of familiarity to the dog and that doesn’t need to happen. Just a bit of encouragement they don’t need.